I have compiled all the remaining extras from the other day, and added in the rest! Dive in! Non participants are welcome, just be sensible please. rhys107, I still need your payment 1 for this GA (or a transaction ID). Please read the conditions on each "band" of items! There are freebies to be had from each band. As I said earlier in the week, please be patient with me. I will reply to you, and parcels will go out on time.. I'm just fairly depressed and not on-line quite as often. There seem to be a lot of these right now (or maybe it just looks that way to me). It's really great to learn about everyone and see their collections! I've been putting off this post since I get really nervous about typing to people for the first time. The collections that focus on a single character (or characters) are so much fun to see. I love looking at everyone's things! You can call me by my LJ name or any shortening of it, like Raze. I have loved Pokemon since I was nine, which is when I started playing Blue and got my first plush! I love collecting plush (both Pokemon and non-Pokemon) and love unusual stuffed animals (I collect plush Gloomy Bears as well. 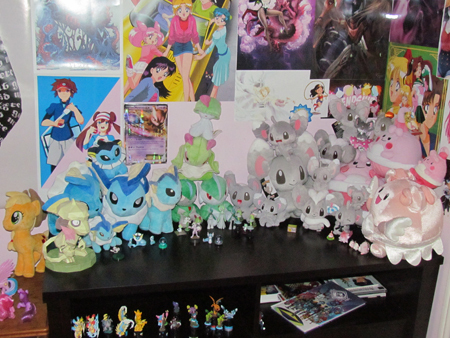 ), so my collection is mainly plush. You can see them under the cut! 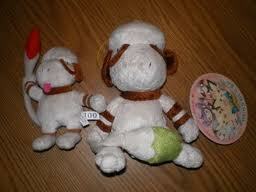 I hope that they make a Herdier plush someday. I want one! What plushies/merchandise would you like to see companies make? I look forward to talking with everyone and seeing more of your amazing collections! Hello everyone!! I have decided that possibly every day I am going to try and sell a bunch of stuff that I have no use for and has been sitting in my closet and other places that I think people here will definitely get use out of. Up for grabs today are two extremely rare shining cards! ^_^ Please make offers. All offers will be considered as long as they are fare. I know these cards can go for alot of money, but I am not trying to get a ton for them, just something reasonable. 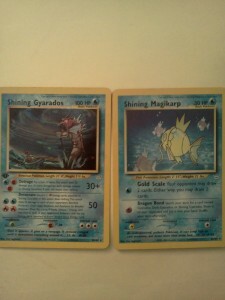 The Gyarados is 1st edition as well!! I received sales permission on 11-28-2010. Thank you!! You will find al the information you need in that post. If not, you're free to ask me anything! 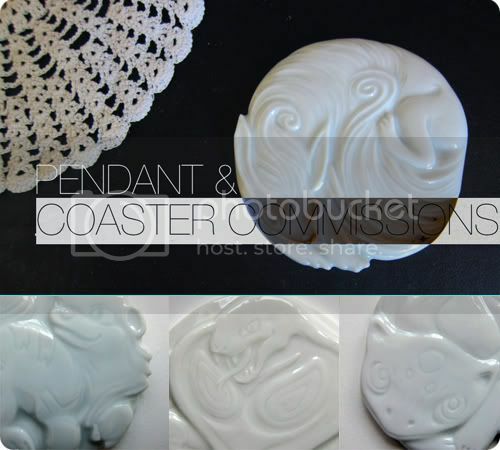 Just a heads up, for now FIVE coasters commissions are wide open, THREE pendants slots are being auctioned off. I just wanted to let you know that I put everything and more up on eBay to make room for my shops revamp. VERY low starting price! Click the picture to be brought to the auction! *Please note I can only ship this within the States due to the size and weight. Also, I had a question! What do you think about notes in your packages? Is it helpful for you to remember who sent the items? Does it help you remember leave feedback? Do you enjoy reading the notes or just throw them out? To anyone who took part in my Clearfile and Bookmark GB or the Metal Tag GB everything has arrived finally. Yesterday was spent sorting out packing it all up including any combines with my metal figure auctions. Im going to start working out postage over the next couple of days so expect a post sometime this weekend for it all! I should be getting a collection post up soon seeing as my Virizion collection has died down now. I have practically everything thats been released for him! And sadly it seems the deers are getting pushed aside to be taken over by Eevees...Argh! So! Im actually gonna be after some Rocket merch. If anyone has the kids for sale I may be interested. Id like anything to be as mint as possible. If you have any random Kojiro or Mushashi merch drop me a comment and I may be interested! Nintendo World: Pickup status and New Plush News! Since it'll take me a long time to reply individually to folks, I wanted to let everyone involved in my Nintendo World pickup that all plush requests were a success!! They had oodles of plush there and I was able to fill everyone's order :) The Tomy stock was quite lacking though, so that was less successful. :c I will be in contact with each person involved once I get home and can properly type on my home computer! So please expect to pay the remaining total and shipping in the next few days. While I was purchasing mass amounts of plush the cashier told me some fun news about upcoming plush! He said they're trying VERY hard to get the 1st gen plush, specifically the starters, in stock. He also mentioned Meloetta, Keldeo, Black Kyurem and White Kyurem plush (he wasn't sure if they were PokeCenter plush or PokeDolls) and most significantly, the 12" (hence 1/1 scale) Emolga and Minccino plush! He said to expect new plush either late this year or early next year. Sounds like we've got some good stuff coming our way in the US! Small Collection Update, Shiny Repaints and N? First and formost this is a small collection update. Shopko was clearing out its pokemon stock for cheep so I finally got a Reshi Jaaks figure to match Zekrom. There's a few other gets as well. Reshi is finally making a small comeback to Char and Zekrom collection XD. i just need to know the price before i commit to purchasing for her. i'm not sure what her limit is and neither is she. i'm also wondering what the current pricing of wailord pokedolls is. i do already have one, but i will need to buy one as a gift eventually. are they still $80-$100?